A ducted system is also known as a forced air system and is one of the most common configurations for geothermal heating and cooling. A forced air system provides heating through a series of ducts that are installed throughout your home. In the summer, cooling is delivered through the same ducts, which makes it a budget friendly option. 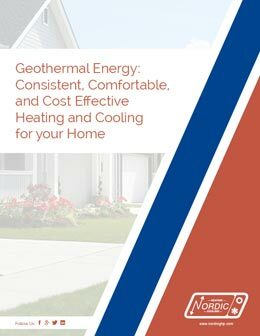 Forced air systems are popular options for geothermal home renovations from an oil furnace or air source heat pump, because the ductwork is often already installed and only requires slight modifications to work with a geothermal heat pump. A ducted system ensures an even, comfortable temperature throughout the home, year round. Ducted systems are commonly paired with our liquid-to-air heat pump. In-floor heating, or radiant heat is fast becoming one of the most popular ways to heat new construction homes. An in-floor heating system uses pipes installed beneath flooring to radiate heat from warm fluid circulated through the pipes. It provides an even, steady heat and the exceptional comfort of warm floors in the middle of winter. In-floor heat is highly efficient and reliable, and is the installation method of choice for most new buildings and large commercial installations. The only down side of radiant in-floor heating is that the process can’t be reversed to provide cooling. This is due to the possibility of bringing the floor below the dew point. Bringing the floor below the dew point causes precipitation to form, making the floor slick and wet. To get around this limitation, air conditioning is commonly handled by reversing the heat pump to produce chilled water, which is pumped to hydronic fan coils located throughout the building. If you like the idea of radiant in-floor heating but don’t want to give up your air conditioning, you can install an all-in-one system that comprises both in-floor heating and forced air ductwork. This will ensure you get the comfort of in-floor heating and full capacity air conditioning in the summer time. We even designed a Nordic® heat pump that can serve both distribution systems. Our liquid-to-air & water heat pump, or TF Series, provides full capacity water heating, and forced air heating and cooling. Also known as desuperheating, all Nordic® heat pumps offer an additional heat exchanger either as part of the heat pump itself or as an option. The desuperheater coil and pump can be plumbed to your hot water tank and programmed to preheat your domestic hot water whenever the heat pump operates. This can save significant costs on your water heating bills.